How do you start a Story about a LEGEND ? The answer is quite simple really, its easier than you think. "WITH A TEAR IN YOUR EYE"
The 'Flying Scotsman' was born in Townhill on January 10, 1922, and could play as either a winger or centre forward. But by the time he made his 'official' first team debut for Liverpool, delayed by the war, Billy was 23-years-old but it wasn't long before he embarked on the success story that made him a legend in our City and earned the club he played for the nickname 'Liddellpool'. After 21 years and 534 games in which he scored 228 goals Billy 'hung up his boots' in 1960 as a hero. Billy throughout his life, lived up to the highest standards and was a role model and inspiration to all playing the game then and for future generations to come, both ON & OFF the field. A superb athlete, he was one of the most complete players of his day and to many OLD FOGEY'S like meself, is still the greatest performer the club has seen. Away from the game he did a vast amount of voluntary work for local boys' clubs and after his retirement he became a magistrate, a lay preacher and bursar of Liverpool University. The unselfishness and sense of duty that guided his life outside football was also echoed on the park. Billy was never anything less than a model professional. Billy was unfortunate that for the greater part of his career at Anfield, there were not enough other players of his ability at the club. A very modest man, he would deny that he was forced to carry the team by himself for long periods of any game. The fact that our team was called by the nickname "Liddellpool" only proved to be an embarassment to our Billy. Liddell won 28 caps for Scotland, a figure that does no justice to his amazing skills. Billy's modest international career was only compensated for by the sheer ADULATION he earned from his beloved KOP. On his full debut, after the war, the hat-trick he scored showed that the powerful outside-left intended wasting little time in making his presence felt. 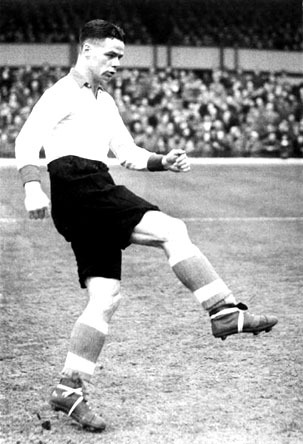 Although Albert Stubbins scored the goals that won the championship that year, Albert never hid the fact that the vast majority of his chances were carved out for him by Liddell. During the 50's Billy's goals often pulled Liverpool out of trouble. But throught the same period the team began to go into decline and even Billy's individual brilliance and bravery could not prevent them from dropping out of the top flight. The task of trying to haul Liverpool to promotion grew tougher and tougher, and when Billy finally decided to hang up his boots in 1960 the Anfield side were still stranded in the Second Division. It took another Billy (SHANKS) to restore them to the top flight, but the exploits of OUR BILLY throughout his 20yr+ career devoted to Liverpool Football Club show that greatness should not always be measured by a single Championship medal. Fans should always remember that Billy was Liverpool Football Club. He was its spirit. He was also its honesty, he was its integrity, he was its heart, and last but not least, its passion. To fans such as my Dad, Grandad and others of the pre-Bill Shankly generation he represented the true way the game should be played. The "Liddellpool" tag the club was awarded was no hype or coincidence. It was fact. My Dad always told me that Billy kept the team going virtually single-handed during that dispiriting eight year Second Division spell we endured in the fifties. I only saw Billy play once meself and so I have no real understanding of what he truly meant to the masses who adorned the KOP week in, week out. Liverpudlians really did appreciate the knowledge that in "Our Billy" they possessed someone who was as good as any other footballer around including Mathews and Finney who were plying their trade at that time. Billy Liddell was the REAL DEAL. Billy's skills meant he was virtually unstoppable down either left or right wing, he was just as unstoppable at centre forward too. How hard he could hit that ball with either foot. His right foot was Dynamite and his left foot Thunder (borrowed from me DAD). Above all else he was a gentleman and a true sport. Whatever the provocation, whatever the circumstances, he was always a peerless ambassador for his club, his adopted City and his Country. A man to be revered. I suppose it was the reverence for him that stood out above everything else. The sheer respect that existed for this truly unassuming man. 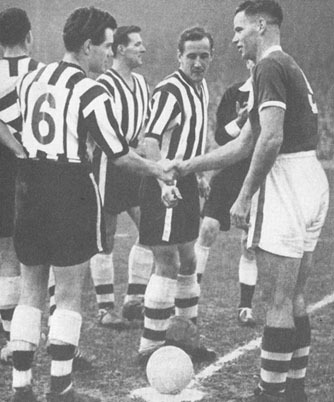 Believe me when I say that, both Red and Blue alike had a mutual respect and awe of Billy Liddell. I have only ever encountered this for two others, one was Dixie Dean (another Billy) and the other was Bill Shankly himself. I think that says everything about the man. Billy Liddell, I salute you. You were a true legend. You were my first footballing hero. You were the best of all because of your LOYALTY, you were ours alone. A true Hero. For the likes of me growing up in Liverpool during the late 50s, I am too young to have seen the man at his best, we simply hung onto the stories that our parents and families told, with a determination and gobsmacked awe. Liverpool were not the most successful side when I was a lad and we were desperate for any success (especially the FA Cup) which we still hadn't won and we were reminded daily by the snotty blue noses in our street. Even at that young age, deep down I knew our lowly place in the footballing echelon and craved success with every breath, but this was not something that you mentioned when talking to the SNOTTY's. "LIVERPOOL ARE GONNA WIN THE CUP"
"LIVERPOOL ARE GONNA WIN THE PREM"
"LIVERPOOL ARE GONNA WIN THE CHAMPIONS LEAGUE"